Hawaii Native Status: Introduced. 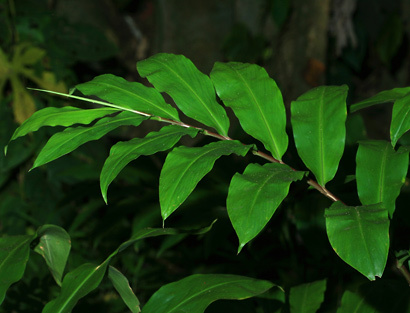 This useful and medicinal Polynesian canoe plant is native to India and the Malay Peninsula. Height: Up to 6 feet (2 m) tall, but usually 4 feet tall (1.2 m) or less. Description: Both the leaves and the pine cone-like inflorescences arise from underground rhizomes. The floral bracts are green when young and red when old. The actual flowers emerge from between the floral bracts and are inconspicuous, 3-petaled, and pale yellowish in color. Although they make long-lasting cut flowers, the inflorescences can be surprisingly heavy and waterlogged because they become filled with a clear, slimy-sudsy, ginger-scented fluid that can be squeezed out and used as shampoo. The shampoo can be left in as a hair conditioner or rinsed out. The seeds are black. The leaves are green and alternate. The leaf sheaths wrap around the stems, and the leaf blades are oblanceolate or narrowly oblong in shape. 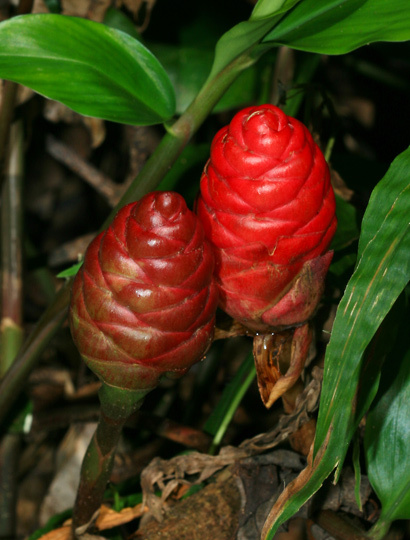 Here in Hawaii, Shampoo Ginger grows in moist, shaded, forested areas. 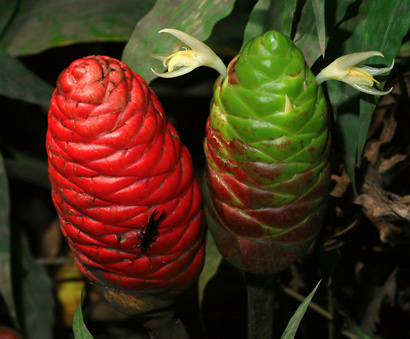 Canoe Plant – The ancient Polynesians brought this plant to Hawaii in their canoes. The fragrant fluid in the flowers was used to shampoo and condition the hair and to massage the skin. The roots were used for medicinal purposes and dried to make a fragrant powder. The leaves were wrapped around baked meat to flavor it. Edible – The underground rhizomes are edible and can be used like those of commercial Garden Ginger (Zingiber officinale), but they are bitter. 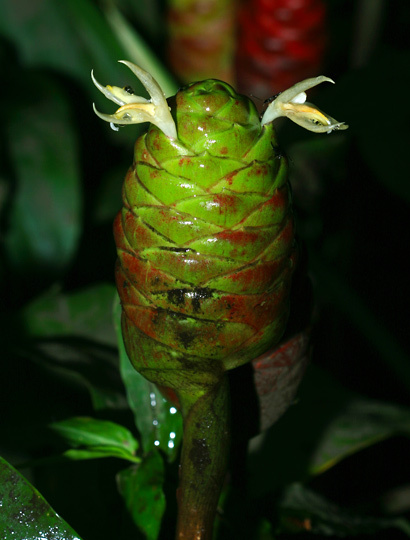 Fragrant – The fluid in the flowers and the rhizomes have a ginger spice fragrance.